In 1961 Disney released their classic animation One Hundred and One Dalmatians, a film so successful that it was re-released in cinemas four times over the coming decades. Due to the film’s overwhelming popularity, it has inspired many adaptations. These subsequent adaptations all have one thing in common: the central presence of Disney’s 1961 Cruella de Vil character. For example, in the 1997 television animation 101 Dalmatians: The Series Cruella was the only character to keep her distinctive British accent. The other characters were voiced with American accents, demonstrating just how disposable they were compared to Cruella. However, there is also another trend evident, one which is unique to the live-action adaptations of this story: all of the actors who have played Cruella have been very vocal about their off-screen love of animals, especially dogs. This seems incongruous with Cruella’s character, as she is an icon of animal cruelty. Yet, surprisingly, this does not damage Cruella’s villainous character. Animal abuse is a very sensitive topic, one which the animal-friendly Disney brand is keen to publicly oppose. Therefore, an off-screen love of animals is a vital requirement for all Cruella actors. Disney’s One Hundred and One Dalmatians was adapted from Dodie Smith’s 1956 illustrated children’s novel: The Hundred and One Dalmatians. 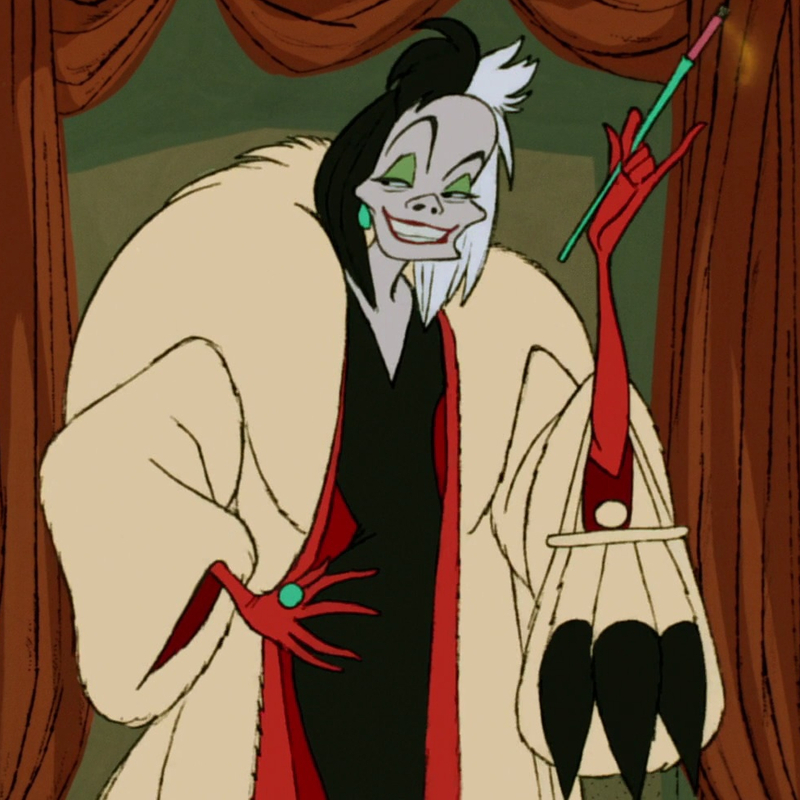 In Smith’s text, Cruella was noticeably prettier, younger, and more elegant than she would later be in Disney’s first adaptation (see figure 1). Figure 1. 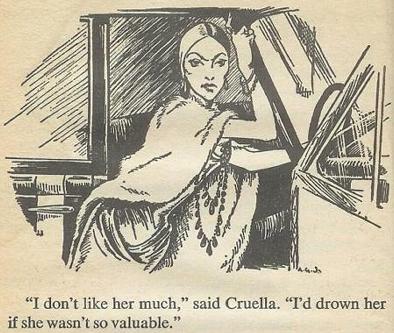 Cruella de Vil as portrayed in Dodie Smith’s illustrated novel. Cruella’s iconic Disney appearance was brought to life by one of Disney’s “Nine Old Men”, Marc Davis, who evidently experimented with different styles before creating Cruella’s notorious look (see figure 2). Figure 2. 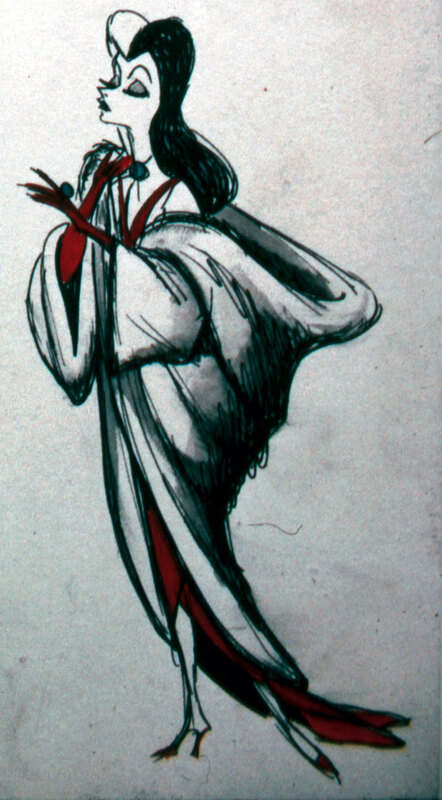 An early Cruella sketch by Davis. As was common with Disney at the time, actors performed the film’s storyboard live to help the animators bring the characters to life (see figure 3). Figure 3. 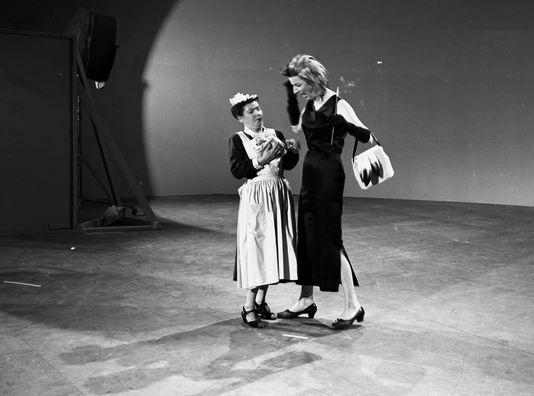 A photograph of Mary Wicks (on the right) playing Cruella. This live-action inspiration, along with Davis’s earlier sketches, led to Disney’s legendary Cruella (see figure 4). Figure 4. Walt Disney Studios’ 1961 Cruella. Disney’s ugly, inelegant, and old Cruella proved much more popular than Smith’s original. In 1967, Smith released a sequel novel, The Starlight Barking, in which Cruella appears only briefly. However, as it was clear from the 1961 film’s success, Cruella was undoubtedly the star of this story, and unsurprisingly Disney showed no interest in adapting Smith’s sequel. However, the Walt Disney Studios have since adapted Smith’s original text again and have also written their own sequels, always centering them around their own 1961 Cruella character, rather than Smith’s. 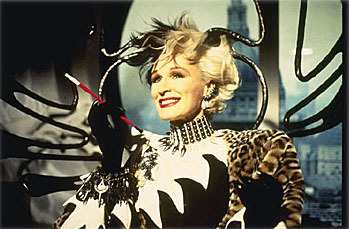 In 1996, the Walt Disney Studios released their first live-action adaptation of the story, starring Glenn Close as Cruella (see figure 5). Close was perfect for the live-action role in several ways: she was dramatic, funny and, most-importantly, she is a vocal animal-lover off-screen, something which was used to promote the film. For example, Close famously insisted that Cruella’s wardrobe must be entirely faux fur. Figure 5. Glenn Close playing Cruella. In 2009, the story was made into a musical: The 101 Dalmatians Musical (although not by Disney). 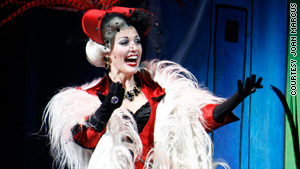 The theatrical role of Cruella was played by Rachel York (see figure 6), who, like Close, quickly established herself as a “huge animal lover” whilst promoting the show. Figure 6. Rachel York as Cruella. Figure 7. 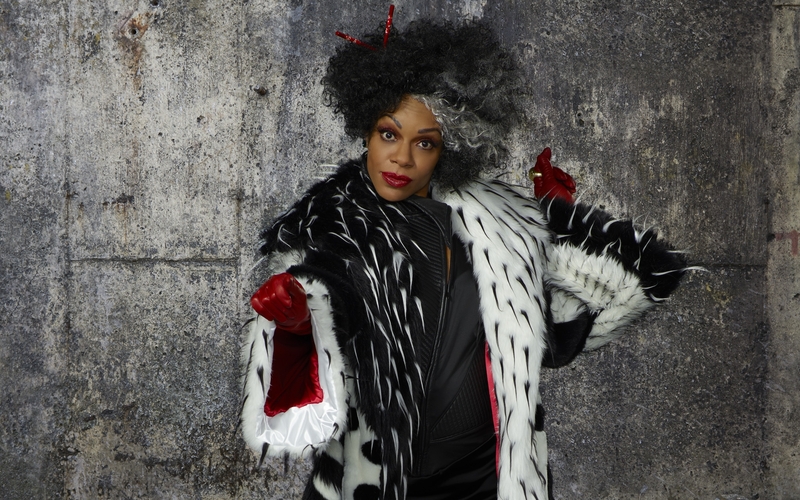 Wendy Raquel Robinson playing Cruella. The casting of the live-action Cruella clearly requires an actor who can be an ambassador for the animal-friendly Disney brand by promoting good animal welfare. However, it is worth pointing out that this is exclusive to Cruella. For example, Glenn Close has never felt the need to confirm that she does not really boil bunnies after her bunny-boiling role in Fatal Attraction (1987). So, why the need to confirm her love for dogs after playing Cruella? It seems that, for Cruella to remain fun, her cruelty must be clearly fake. Figure 8. 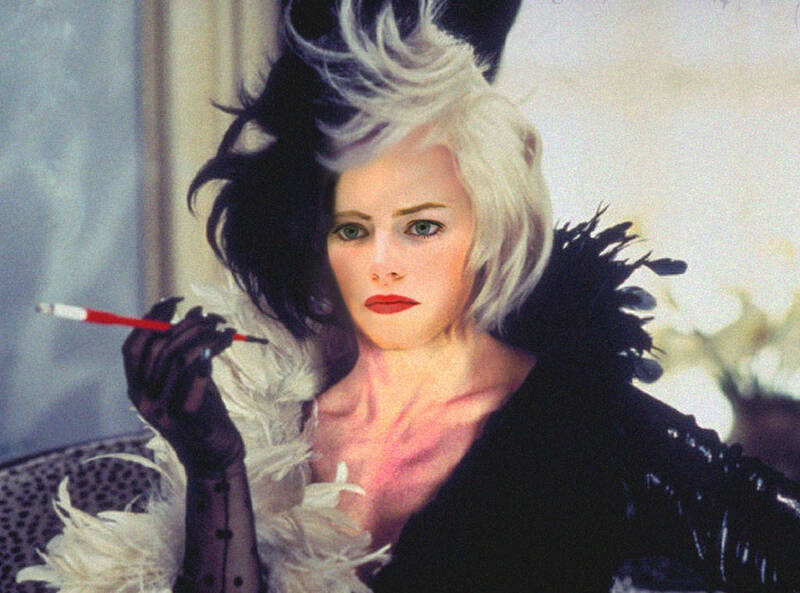 Emma Stone’s Cruella. Unsurprisingly, Cruella’s adaptation journey is not over yet. The Walt Disney Studios are currently developing another Cruella-focussed live-action film, aptly titled Cruella. The title role will be played by Emma Stone (see figure 8), who, predictably, like the other live-action actors before her, is also a vocal animal-lover. Rebecca Rose Stanton is a 1st year PhD student at Northumbria University (U.K.). Her research studies depictions of animals and animal abuse in Walt Disney Animation Studios’ films.